"Exposed! Discover the Hidden Secrets The #1 Direct Response Web Designer Uses To Rake in Millions Of Dollars For His Clients Every Year "
Do you ever wonder why you hear stories of some websites making thousands, sometimes even millions of dollars in a single week? Many people think it's because the "big dogs" have huge marketing budgets or pay professional web designers to create the perfect website. In "Inner Circles" this man needs no introduction. However most of you might not have heard of him. Dave is one of the elite direct response web designers in the business. The difference between him and 99 of other web designers is he creates websites with one purpose in mind - to sell and make money! Yes all the guys mentioned above are the best in the business. The only problem is you can't hire Dave to work for you anymore . He's stopped taking on new clients! But there still is a way learn the secret "response boosting design tricks" Dave uses to create insanely profitable websites. The best part is these design tricks take minutes to implement, but can increase your sales by as as much 700! Today you can own the "Make My Website Sell" Package. Consisting of a 2 hour Interview with Dave Mizrachi telling you how to create websites that really sell (As much as $1.2 million in 7 days) , with full transcripts and a "fill in the blanks" work book. Learn the exact methods Internet Guru's use to rake in fortunes online with their websites. After a lot persuasion I finally convinced Dave to reveal all the special design tricks he uses to create these killer websites. We held a special "no holds barred" 2 hour teleseminar in which Dave and special mystery guest and expert copy righter Michel Fortin spilled their guts. 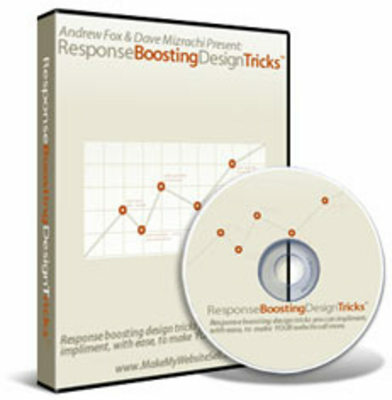 28 simple response boosting design tricks that can explode your sales and conversions from 3 as high as a whopping 298! The one graphic Dave added which increased his opt in rate from 9.5 to an eye popping 16.9! As a limited time only we are giving 5 direct response website templates that could easily sell for $97 each. You are free to use these templates with any of your existing websites. Or you can use them for any new products you have. Just think - you will save you $100's on web design fees! If you've been wondering how to make your website sell using nothing but free techniques then this information is priceless. Remember you can't even hire Dave to personally work with you anymore - he's not taking on any new clients. You get to learn cutting edge web design techniques for just pennies on the dollar. With that said, can you believe the price of the Make My Website Sell Audio Teleseminar Package isn't even $1,000? No, it's not even $500. Or $300. Or even $200. Can you believe that your investment in this incredible package is only $7? Yes, I know it sounds ridiculously under priced because you could easily spend that amount or more in a week just buying a couple of the latest ebooks on clickbank -- for the privilege of reading them and learning from them -- and not even having a product you can sell to make money! Do nothing -- and remain the same internet marketer with the same business and same challenges you've always had. Still... working hours upon hours trying to promote a single website with a product that doesn't sell -- and still... not make anywhere near the type of money you want to make. Grab the the Make My Website Sell Audio Teleseminar Package! and earn the type of money you want to make right now I think your choice is clear. Yes! I'm More Than Ready To Grab the Make my Website Sell Audio Teleseminar Package for just $7. P.S. Imagine how exciting it will be learning the secrets of the pros for just a fraction of what they paid. . Don't Delay. Order Now.